Anna White Hosea began her development career in 2002. Her experience includes campaign development, major gifts and gift planning work with individual donors, membership and annual giving programs, special events, systems and database management and working with board members and volunteer committees. Before joining moss+ross in 2018, Anna worked at Ravenscroft School as director of development. At Ravenscroft, she helped plan and launch the recently completed $15M+ Embrace Possibility Campaign. Her work included developing and overseeing campaign strategies and systems, volunteer development and management, lead and major gift solicitations and planned giving. Before returning to the Triangle, she worked at Holton-Arms School just outside of Washington, DC where she served in several capacities, concluding as director of advancement. At Holton, Anna led the annual fund to break and surpass $1M, developed the school’s first major gifts and planned giving programs, and identified and cultivated relationships with new major and planned gift donors resulting in $4.5M in new gifts. Anna began her development career at the National Gallery of Art in Washington, DC where she was part of the team responsible for building and managing the museums primary membership program, The Circle. Outside of work, Anna enjoys teaching and writing about development work. She is a contributing author on alumni fundraising to NAIS’s Handbook of Philanthropy at Independent Schools, Fourth Edition. She was a faculty member for the 2016 CASE Conference on Parent & Family Engagement and conference presenter at CASE-NAIS from 2014-2016. 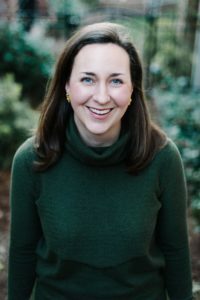 In addition, she served on accreditation teams for Charlotte Country Day School (Charlotte, NC) and St. Mary’s Episcopal School (Memphis, TN). A Raleigh native, Anna graduated from Vanderbilt University with a degree in English and minor in Art History. She lives in Raleigh with her husband, Robert, and sons, Henry and Edward. As a volunteer, Anna currently serves as Development Chair of the Board of Directors for StepUp Ministry in Raleigh. In addition, she chairs the Development Committee for Spoleto Study Abroad, an arts and humanities program for high school students, educators and adults based in Spoleto, Italy. In her spare time, she enjoys cooking, reading and attempts at gardening.